Some 'Energy Star' Appliances May Not Be That Green At tax time, many consumers are cashing in on tax benefits that come with Energy Star appliances. But Consumer Reports says those products aren't always as energy-efficient as billed. The Government Accountability Office concluded that the Energy Star program is susceptible to fraud and abuse, after investigators received certification for 15 phony appliances, including a gasoline-powered alarm clock. At tax time, many consumers are cashing in on tax credits and rebates that come from making their homes more energy-efficient. 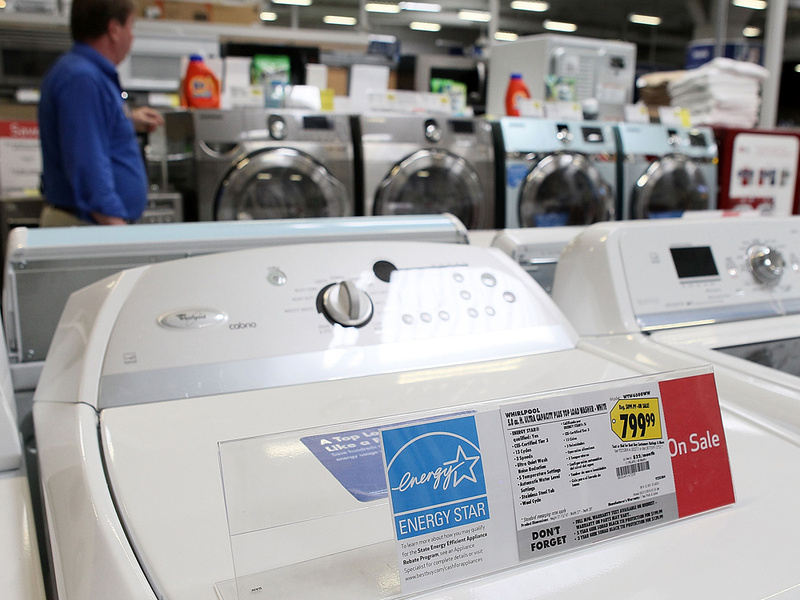 One key tactic: Buy an appliance approved by the government's Energy Star program. But there is evidence that products with the Energy Star seal don't always live up to their billing. "We find that not all of the products are as efficient as they claim to be," says Celia Kuperszmid-Lehrman, deputy home editor for Consumer Reports. The tax benefits are aimed at encouraging homeowners to replace outdated and energy-hungry furnaces and appliances. But Kuperszmid-Lehrman tells NPR's Steve Inskeep that not all of the newer models skimp on power consumption. "We found, particularly, problems with refrigerators," she says of tests Consumer Reports conducted on certified products. The magazine reported that two of the refrigerators it tested used about 50 percent more energy than the numbers on their labels. Another pair used 39 percent more and 33 percent more. Part of the problem, Kuperszmid-Lehrman says, is that the Energy Star program is self-certifying -- meaning the government doesn't independently confirm the data it gets from manufacturers. There are some serious problems ... because you do have manufacturers self-certifying — and you don't have anyone checking on them. "They're the ones that say, 'Yes, my product is energy-efficient,' " she says. "And for the most part, that's working very well, but there are some serious problems with that, because you do have manufacturers self-certifying -- and you don't have anyone checking on them." In a recent test by the Government Accountability Office, the agency submitted 20 completely bogus products for Energy Star certification. Of the 20 applications, 15 were approved -- including one for a gasoline-powered alarm clock. "One of the things that I found very disturbing about the report, in addition to the bogus products that got the Energy Star" certification, says Kuperszmid-Lehrman, "was how quickly they got the Energy Star -- how quickly those products became listed on the Department of Energy's Web site. "So that if a consumer was looking for a product, they would think that that product was more efficient." The Department of Energy has said it will soon change the system to include third-party verification. Kuperszmid-Lehrman says that's a good start -- but she also thinks the Energy Star testing system needs to be retooled. "Many of the tests themselves are woefully out of date, and they don't necessarily replicate the experience that the consumer's going to have in the home," she says. Still, Kuperszmid-Lehrman doesn't think that people shopping for energy efficiency -- and a tax break --- should ignore the Energy Star program altogether. "I think it's a good relative rating," she says. "But there are instances like I've mentioned with refrigerators, with freezers, that the numbers are not quite what they seem to be."